Use God’s powerful Word to lead the tender hearts and minds of your K5 students to God’s path for them! With this Bible kit, you will be equipped with all the tools you need to use Bible time to guide them to character and godliness—17 items total. The colorful visuals and narrative presentation will keep your students fascinated as they study the lives of Abraham, Isaac, Jacob, Joseph, Enoch, Noah, Adam, and Jesus. 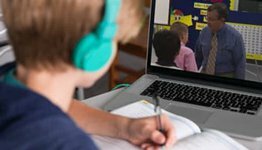 Through memorizing Bible verses, they will have God’s Word to help them daily as they learn about Creation, salvation, Christ’s crucifixion and resurrection, missionaries, and more. Complete Bible time program. 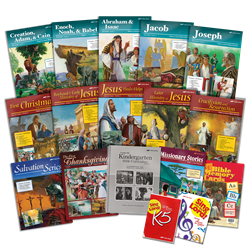 The Bible curriculum gives you daily lesson plans incorporating a Bible memory verse for each letter of the alphabet, song time using the Little Ones Sing unto the Lord K5 CD, prayer time, doctrinal drill, and Bible stories from Genesis and the life of Christ. 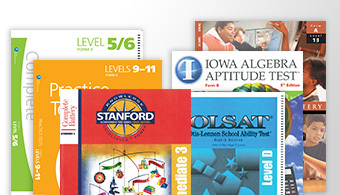 Through your use of our organizational tools and high-quality teaching aids, your students will look forward to Bible time each day. 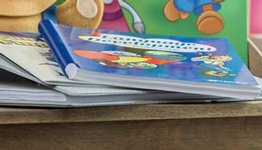 Optional materials include the K5 Bible Activity Book and Miniature ABC Bible Memory Cards. Story format. Jesus often used stories and parables to communicate His message to the hearts of his audience. Use the 13 sets of Flash-a-Cards, complete with lesson guides for the entire year, to keep your students eager to hear God’s Word. The stories of the Bible can open your students’ hearts to trust in God and obey His Word. Realistic visuals. Often Bible stories for young children are done with cartoonish figures that make the Bible seem less than real. These visuals painted by professional artists make the Bible come to life with realistic facial expressions and appropriate time period settings that capture the imagination of each student.